The 1995 Roanoke-Benson/Lowpoint-Washburn Baseball Team capped a perfect season (30-0) by winning the IHSA Class A state championship, becoming the first Illinois baseball team to enjoy an undefeated state championship since Peoria Manual (25-0) in 1950. While the RB/LW squad was averaged 6.8 runs per game with a .318 team batting average, the team truly excelled defensively by committing just 27 errors in 30 games with a .967 team field percentage. The defensive effort helped the pitching staff allow just 30 runs the entire season with 12 shutouts, three no-hitters and three more one-hitters. The pitchers also struck out 274 opposing hitters, while allowing just 31 walks. The state tournament run included a 13-0 win against Stronghurst Southern (13-0) in the quarterfinals, a 5-4 victory against Harrisburg in the semis and an 8-2 win against Byron in the state championship game. L to R: Jim McClung, Warren Womble, Howard Crittenden, Al Kelley, Leo Byrd, Don Ohl, Jerry Hale, Jack Adams, Lyndon Lee, Thornton Hill, Leon Hill, Gary Goble, Bob Boozer, Dave Plunkett, John Prudhoe. 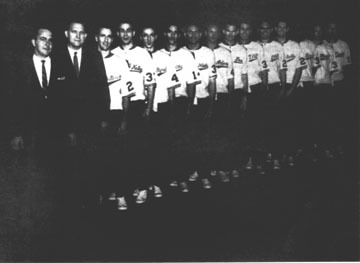 THIS CATS TEAM fared no better than 16-16 for the 1959-60 National Industrial Basketball League season - and needed a victory in their final game over the last-place New York Tuck Tapers to break even - before traveling to Denver for an Amateur Athletic Union Tournament bid that didn't end until a 115-99 championship game over the Akron Wingfoots. The Cats won 90-76 in the semifinals over the Phillips 66 Oilers after edging the Cleveland Pipers 84-82 and downing the Chicago Jamaco Saints 98-73. Bob Boozer of Peoria was named MVP of the tournament and, along with teammate Howie Crittenden, earned AAU all-American recognition. Also scoring in double figures for Caterpillar in the record-breaking title game win over Akron were Jack Adams, Al Kelley, Leon Hill and Don Ohl. Caterpillar continued to win in the Olympic Trials, and wasn't stopped until the NCAA University All-Stars (Jerry West, Oscar Robertson, et al) ran past the Cats 124-97 in the championship game. This post-season left Cats head coach Warren Womble with a 58-7 career record in AAU and Olympic Tournament games, and Caterpillar soon dropped sponsorship of the team to end a basketball era in Peoria.